Just because 3DS is seeing an outing from the top hat professor in the form of Professor Layton and the Mask of Miracle doesn't mean that Konami won't try to steal a little of the astute one's thunder. 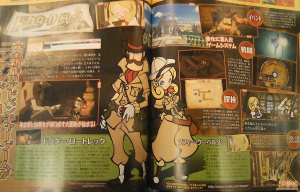 This week's Famitsu magazine contains a reveal of Doctor Lautrec and the Forgotten Knights, an archaeology-themed game starring a Doctor wearing a top hat. Although little was revealed about the overall style of gameplay, Famitsu reveals the game will feature four varying gameplay modes: events, battle, exploration and conversation. It's not Konami's only 3DS title either, with Asphalt 3D due for release shortly after the machine launches. Er... I honestly don't know what to say. But what a nice scarf. Looks like an interesting game. I like the old-fashioned poster aesthetic. I wonder how it will play. And... that doesn't look like a top hat so much as a very large beret or something. What about Metal Gear Solid: Snake Eater? IMO that's way bigger. Like the Toulouse gag. is it really based on Toulouse Lautrec, as poster implies? That would be great! Detective by day, libidinous dwarf painter of prostitutes by night. Hey, I have that poster! Can't come up with any original ideas? Just rip-off someone else's original idea! Only if Jose Ferrer plays Toulouse-Lautrec. I have no idea if there's a genuine Toulouse Lautrec connection, but so far nobody's scanned in Famitsu so I've got no artwork from the game itself. Apparently the art style is similar to Layton so we'll have to wait and see! Layton, but French? Sounds... Interestante. Also: The caption writer is not a rugby fan. Fact. That's amazing. How did you know that?! James there's a scan apparently out now... but I don't know where, I'll try to track it down. How dare they try to steal some of Mr. Layton's thunder! This....this...thing will never come close to the greatness that is the Professor Layton series! Here's the scans. It just screams Professor Layton about 2 inches away from your ear. Wait, theres going to be battle scenes in this? im confused as to how that will fit in, if its anything like Proffesor layton. Oh, it has a top hat.